Having an undead girl in one's room is cool. Having a crying undead girl in one's room... not so cool. It especially stinks when the girl is town legend, Lizzie Monroe, who killed herself in 1862 when she got news that her fiancé died in the war. Only, Lizzie didn't die... not in the conventional way at least. Oh, she thought she had. She spent the last century thinking she was locked in Hell. In reality, she'd been stuffed in a wall at the old Dixon Church.... the abandoned church Shane Davis just happened to burn down. Now that Shane has her, he has no idea what to do with her. He can't release her into the "wild" because people will recognize her. He can't send her away because her muscles have stiffened from her time in Hell. And she can't stay because if people find her, they'll know he burned the church. Being eighteen now, Shane definitely doesn't want that fact coming out. Unfortunately for both of them, someone else finds out about Lizzie and the source of her being alive and that person will do anything to get it, even murder. “He knew he should be freaked out with the zombie-ish girl in his bed. Okay, sure it was pretty cool to have a zombie in his bed if he wanted to be honest, but who knew when she'd pop up and try to eat his brains. He wasn't exactly sure what she was, but zombie seemed as good of a descriptor as any. She was dead, not she wasn't.... or maybe she was. He was so confused. Lizzie Flippin' Monroe was in his bed, in his house, and he wasn't sure what to do with her." “Sure, in her day, she'd killed herself so she wouldn't have to face home without Daniel. That turned out well for her, didn't it? Now she had no Daniel, no mother, no real home. And no idea how to act in this twenty-first century." “I died years ago.No! No, you didn't. Why couldn't she just understand? You are alive for a reason. I don't know what it is, but I know it's not for Drake's mother. The world needs you, Lizzie. He couldn't look away. I need you." Maybe when you kill yourself you end up living forever in your own private hell. Lizzie Monroe died a few hundred years ago. She killed herself in her families barn after a soldier of war came to tell her that her fiance, Daniel had been killed. She knew then what she must do. Now one hundred and fifty years later, the church that she is buried in is burned to the ground by Shane and his band mate Preston. As they are burning the church down they hear screams from inside. What was the noise they are hearing? How could someone be in the church? Both of the boy freeze. Shane is the brave one that goes in to check it out. Sure enough there is a young girl screaming but what Shane doesn't realize is that the screams are coming from Lizzie Monroe, the girl who supposedly should be long dead and gone. The premise of this story is so exciting to me that I had just had to review it. I couldn't believe that a person could kill herself but yet not be dead. The synopsis had me hooked on this book from the first time I read it. The writing was superb. The author gives us little clues each chapter but doesn't reveal anything that would spoil the fun. A book that is hard to predict is the best because you are on the edge of your seat wondering what will happen next. Creepy. Exciting. Exhilarating. So much fun. This book had everything a romance, a spooky premise and even a bit of humor as well. While the story is being told, it flashes back to the time when Lizzie was young. It tells us how she became Daniel's fiance and even how she killed herself. The back and forth from present day to civil war times was so interesting to me. It helped to understand why Lizzie was having such a hard time grasping where she was today and how different things seemed. The author really wrote on point when flashing back. She made sure not to confuse the reader but to tell us just enough to make us interested in the more to come. This story had an inspirational flare to it that I just was NOT expecting but ended up making the story even more amazing to me. Shane had no faith. He grew up without his father and him and his mother really don't see eye to eye. In walks Lizzie. Shane can't believe there is a dead girl in his bed and that he of all people saved her from the flames of the fire. He is not one of those knight in shining armor types and he has a real problem with his current situation. Will Lizzie show Shane how to feel again or will Shane make Lizzie realize that people just don't care? Such an original story, told beautifully. A great and powerful read in my book. 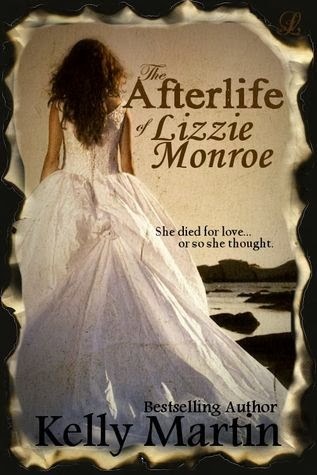 What you can win: An e-copy of "The Afterlife of Lizzie Monroe" and a $5 gift card to Amazon. I'm a southern mommy who writes YA/'dark' or 'edgy' inspirational fiction (all the suspense, less of the cussing ;) ). By day, I'm a preschool teacher. By night, I'm a crazy-haired multi-tasker who writes and plots with three kids running around (and/or sitting on me). My favorite books are those that I get so caught up in that I look down a few 'minutes' later and I'm 100 pages from where I stared. My first novel, CROSSING THE DEEP, has been called called "unexpected" and an "incredible read". It is available now. My second, SAINT SLOAN, is about a girl who wants the perfect 18th birthday, and her attacker who has other ideas (duh, dun, dun!) It's also a YA. BIG IS BEAUTIFUL is coming out Sept. 2013. THE DECEPTION OF DEVIN MILLER is coming out July 23rd! I love God, am addicted to chocolate, and would rather write than sleep.